I nternationally acclaimed perfumer and founder of CB I Hate Perfume, Christopher Brosius, is proud to announce the latest fragrance to join the CB I Hate Perfume collections, #106 Invisible Monster . An afternoon spent on the banks of the Susquehanna River in rural Pennsylvania is the inspiration behind the latest Secret History Scent – all of which signify an important memory in Christopher Brosius’ life. This moment comes from childhood, where a lazy day traveling on a boat near the river banks left Brosius feeling like one of his favorite TV characters on an adventure, Johnny Quest. “I remember the boat slipping slowly down the channel between the islands. I was perhaps eight. high-tech hovercraft only to be repelled by our own incredible technology. Of course, this future is not how life unfolded for Brosius. He is not a world-famous scientist, nor does he jet around the globe at the drop of a hat. But, this afternoon and his imaginary adventures as Johnny Quest are kept alive through his unique gift as a perfumer. Also by the Hadji, which was at long-last found, and black turtlenecks, which he still wears today. INVISIBLE MONSTER is the scent of a rare Chinese orchid with a brisk lemony perfume balanced against a green jungle riverbank. Some of its notes include: Sumac, Vetivert, Oakmoss and other specially-designed accords that capture the smell of the islands in the Susquehanna River. INVISIBLE MONSTER is currently available in 15ML Absolute ($95) and a 100ML Water Perfume ($85) at the CB I Hate Perfume Gallery in Brooklyn and online at cbihateperfume.com. Christopher Brosius is a Fragrance Foundation award-winner and is the first perfumer to ever be recognized by the Cooper Hewitt National Design Museum for the way scent is designed. He has created countless groundbreaking scents and continues his work today through his namesake label, CB I Hate Perfume. 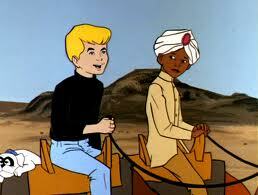 Okay anyone else remember Jonny Quest and Hadji? Boy, that was a bounce back in history when I read this one. I checked their website, and didn’t see it available for ordering, but I’ll check when I’m in NYC next week and see if it’s in the store and if we like it! By Kilian In the Garden of Good and Evil & winner of the Jasmine Perfume! JUL ET MAD perfumes and a giveaway! Previous Article← Amouage Memoir Giveaway Winner! CB better have it, but I may call ahead to see if he’s going to be around on Friday! Very cool post, Patty! This scent sounds very intriguing. Boy, howdy, did I get a flashback from Jonny Quest — too fun!! jonny quest was my favorite cartoon! it had the BEST music track ever! and of course i loved race banyon and bandit the dog. Never saw Johnny Quest, but this perfume sounds great, doesn’t it? It’s intriguing that he wanted to be a scientist and fly around the world – being a perfumer is sort of like that, and he’s living in New York City – that’s a long way from rural Pennsylvania! And you can travel the world within NYC, basically. I’d say he’s gone a long way toward realizing that dream already. Loved Johnny Quest, and agree, Race was HOT! The cartoon made me want to live in exotic lands, and have dangerous adventures. The perfume sounds intriguing, and I hope to try it next week in NYC. I’ve never been to Mr. Brosius’ shop, and I’m afraid his ultra realistic accords may be dangerous to the pocketbook 😀 Be well.